As everyone knows, Easter is a time when we tend to eat foods that we don’t consume much of the rest of the year, though gone are the days when hot cross buns weren’t available to buy except at Easter. Now that the major coffee shop chains in both the UK and the US like to vary their drinks menu to offer seasonal variations on coffee and hot chocolate, it seems customers are now expecting to see new offerings in their local coffee house no matter what the occasion. So here are a few of our Easter favourites that are so easy to make and add a bit of fun to your menu. This one is surprisingly good, and we can say this with some confidence – we genuinely made these ourselves last Easter and they were an instant hit. Here’s how to make yours: add 2 shots of prepared espresso, 1oz of either toasted or plain marshmallow syrup, and ½ oz of white chocolate syrup in a latte glass. Finish with around 12oz hot steamed milk and complete with some whipped cream and a few marshmallows for decoration. Not the lowest calorie coffee we’ve ever seen but worth blowing the diet for. OK, so this might sound like adding the word ‘bunny’ to the recipe is the only thing Easter-like about this one, but bear with us. Take a glass and add a single shot of prepared espresso, 1oz of sugar free chocolate syrup, and finish it off with around 8oz of steamed skimmed or semi-skimmed milk (depending on how guilty you’re feeling). Add some chocolate shavings to the top before serving. Your customers will love you for it. Although this is usually an alcoholic when made at home, you can make a non-alcoholic version for serving to customers too. Starting with a double espresso in a tall latte glass, add some steamed milk, a spoon of brown sugar and a three shots of syrup – chocolate, amaretto and vanilla. The vanilla is optional (as is the brown sugar) if you find it too sweet, or you can of course use more milk to keep the flavour but lose some of the sweetness. Serve with a couple of caramelised biscuits on the side. 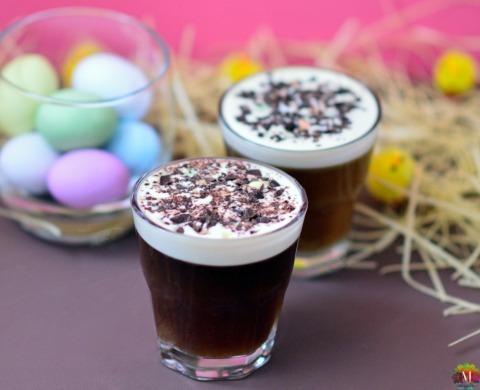 We hope you enjoy trying some of these – Happy Easter from everyone here at A1 Coffee. What's So Special About Arabica Coffee? Make the ultimate hot chocolate!